· Right-handed pitcher Joe Kelly was placed on the 15-day disabled list with a right shoulder impingement. · Right-handed pitcher Noe Ramirez was recalled from Triple-A Pawtucket. · Right-handed pitcher William Cuevas was selected to the active roster from Pawtucket. · Infielder Marco Hernandez was optioned to Pawtucket following last night's game. Additionally, to make room for Cuevas on the 40-man roster, left-handed pitcher Edwin Escobar was designated for assignment. Kelly, 27, was removed from his start against the Rays last night in the first inning due to a right shoulder impingement. In his three starts for Boston this season, the right-hander has gone 1-0 with a 9.35 ERA (9 ER/8.2 IP) and 11 strikeouts. For his major league career, Kelly is 32-22 with a 3.92 ERA (205 ER/470.1 IP) and 341 strikeouts in 106 games (76 starts) between the St. Louis Cardinals (2012-14) and Red Sox (2014-16). With Boston, he has gone 15-8 with a 4.80 ERA (109 ER/204.1 IP) in 38 games, all starts. Ramirez, 26, returns to Boston for his second major league stint of the season. The right-hander, who made his first Opening Day roster, had appeared in six of the club's first 12 games before being optioned to Pawtucket following Monday's game against Toronto. For Boston this year, Ramirez had no record and a 4.91 ERA (4 ER/7.1 IP) with eight strikeouts. For his major league career, Ramirez, the Red Sox' fourth-round selection in the 2011 June Draft has gone 0-1 with a 4.43 ERA (10 ER/20.1 IP) and 21 strikeouts in 23 appearances, all with Boston (2015-16). For Cuevas, 25, this will mark the first major league stint of his career. Over two starts for Pawtucket this season, the Venezuelan native has gone 1-1 with a 6.17 ERA (8 ER/11.2 IP). In his most recent outing on April 15 at Lehigh Valley, Cuevas earned the win after allowing three earned runs on seven hits in 6.2 innings with one walk and four strikeouts. 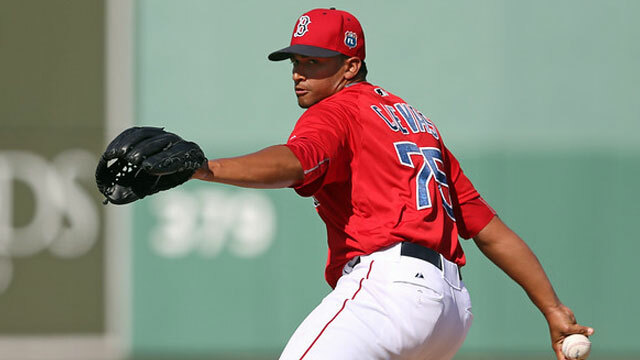 A non-roster invitee to Red Sox spring training this year, Cuevas was originally signed by Boston as an international free agent on July 2, 2008. He will wear No. 63 for the Red Sox. Hernandez, 23, appeared in one game for Boston in what was the first major league stint of his career. The Dominican native made his big league debut in this past Sunday's game against the Toronto Blue Jays, starting at second base and going 1-for-2 with a run scored and a walk. Over seven minor league seasons between the Chicago Cubs (2010-14) and Red Sox (2015-16) organizations, he has hit .280 (625-for-2,233) with 112 doubles, 30 triples, 26 home runs, and 258 RBI in 583 games. Escobar, 23, began this season with Pawtucket and has made one start and two relief appearances. He allowed three unearned runs in his season debut, a start on April 9 against Buffalo, and has since thrown 3.0 scoreless innings in two relief appearances. Acquired by the Red Sox along with right-hander Heath Hembree in the July 26, 2014 trade with the San Francisco Giants, Escobar has no record and a 4.50 ERA (1 ER/2.0 IP) in two major league appearances, both with Boston in 2014. Escobar was originally signed by the Texas Rangers as an international free agent on July 2, 2008.